The next SAT will take place on May 7, and the deadline to register for this exam without a fee is April 8. Those of you who are registered or plan to register, are you prepared for it? Do you feel comfortable with the new SAT format? Do you think your score will reflect your maximum learning potential? Answer “yes” to all of these questions after taking LRC’s SAT Prep. 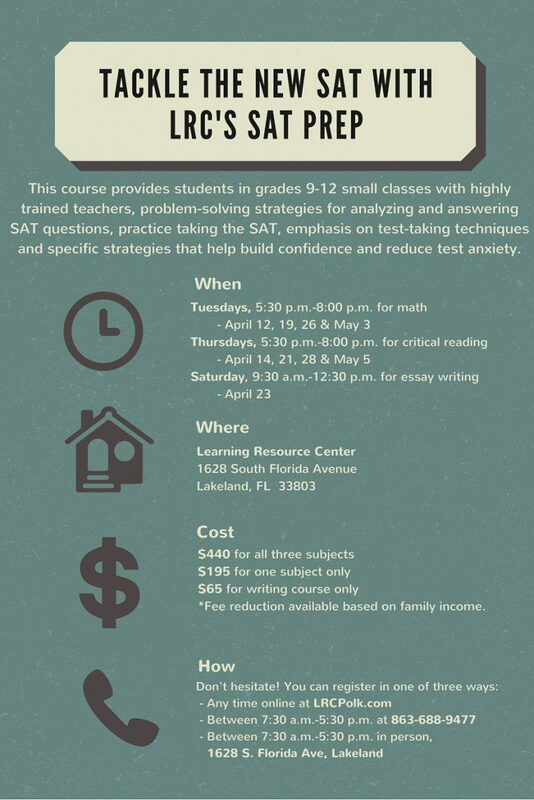 The course will begin on Tuesday, April 12 and will take place on Tuesdays and Thursdays for four consecutive weeks, through Thursday, May 5 at the Learning Resource Center in Lakeland. In addition to the four Tuesday and Thursday sessions, the course will also include one Saturday session. Find more details in the graphic below. Reserve your place by registering today! 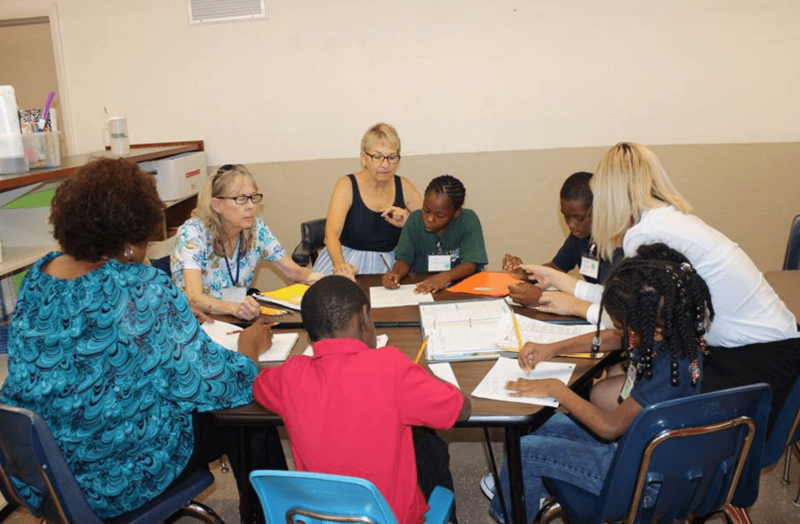 Did you know that the Learning Resource Center offers numerous volunteer opportunities throughout the year, annually? We’re looking for people with a will to help, an interest in education, good customer services skills, and the ability to support our vision of providing high quality, customized academic opportunities to help students reach their maximum learning potential. If you match these qualifications and are seeking community service hours, looking to assist local students or desiring for a meaningful way to make use of spare time, then please don’t hesitate to contact us about the opportunities below! We will soon be in need of many summer volunteers to assist with Camp READY!, our kindergarten-readiness program. Last year, the camp took place at nine sites throughout Polk during June through August. Each site’s camp will last four weeks. While we are still working on the specifics of each site for 2016, we are accepting volunteers. Only have an afternoon or morning available? We can work with that. Regardless, please contact us at RebeccaT@lrcpolk.com to express your interest and receive more information. We look forwarding to working with you and guarantee it’ll be a rewarding experience! The spring College Success Planning course for grades 9-12 is just around the corner. 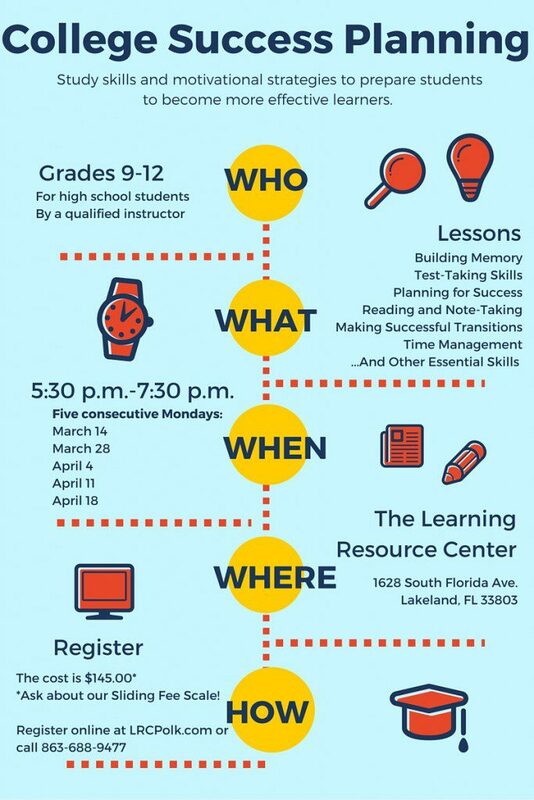 Get the competitive edge with this five week course beginning March 14 and taking place on Mondays only from 5:30-7:30 p.m. at our office in Lakeland. Enrollment is now open, and you may register at LRCpolk.com/programs/college-success-planning. Montessori classrooms are filled with diverse groups of engaged students working and learning according to their individual interests and abilities. Soon, you’ll be able to see these multi-age classrooms in action in downtown Winter Haven. Cypress Junction Montessori, a new public charter school, will open in August for the 2016-2017 school year with students ages three through sixth grade. The school will add seventh grade in 2017 and eighth grade in 2018. The open enrollment period for Cypress Junction Montessori began on February 19 and will remain open through March 18. The application is simple, takes less than 10 minutes and can be found at CypressJunction.org/Apply. The charter school’s enrollment will be determined through a random lottery process, just like those used at many other area magnet and charter schools. Families will be notified of the lottery results during the first week of April. Open enrollment is also taking place for students who will enter kindergarten in 2017 or 2018. This would be children born between 9/2/2011 and 9/1/2013. The deadline for these application is also March 18, with notification letters going out the first week of April. Students selected in the random lottery for these future Kindergarten classes will be offered a spot in the three- and four-year-old preschool program that is part of the primary classroom, but they are not required to attend the preschool program to reserve their seat in their kindergarten class. The early lotteries are being conducted because the Montessori Method starts at three years old within the primary classroom made up of three- to-six-year old students. Learning that takes place during these years comes spontaneously without effort, leading children to enter the elementary classes with a clear, concrete sense of many abstract concepts. The early years in the Montessori experience often nurtures a joy of learning that prepares children for further challenges. While students can be successful entering the program at any age, research shows this process works best when children enter a Montessori program at age three or four as part of a mixed-age classroom, so CJM is proud to offer the opportunity to begin in the Montessori environment as early as age three. At any age, Montessori helps children to become self-motivated, self-disciplined and to retain the sense of curiosity that so many children lose along the way in traditional classrooms. Montessori students are able to work at their own pace and ability, and they tend to act with care and respect toward their environment and each other. As students continue on toward middle school, work becomes increasingly more independent, student-driven and project-based. The Montessori middle school program focuses on helping students actively engage in and question the world around them. Guided by questions,“How do we know?,” “Why does this happen?” and, ultimately, “Why is this significant?,” the students investigate and critically examine concepts and ideas through on-going interactive experiences and discussions in which the emphasis is placed on quality and depth of thought, mastery, imagination, passion and adaptability. By providing students with educational experiences that foster intellectual, emotional, aesthetic, physical and social growth, the Montessori middle school program seeks to instill resourcefulness, a sense of social responsibility and a lifelong love of the acquisition of knowledge and its responsible application in this world. In this environment, it is safe to risk opinions and consider vast, unfamiliar points of view. Montessori students who transition to traditional high schools typically become leaders among their peers and perform well both academically and socially. Cypress Junction Montessori will be located in downtown Winter Haven at 201 Ave. B SW as the sole occupant of a newly renovated and expanded campus. The current building will be renovated and expanded to approximately 13,000 square feet of classroom, administration and other educational spaces. The new location partially inspired the name for the charter school: Cypress Junction Montessori. Efforts to find a name that tied into the history and culture of Winter Haven led to the cypress tree, an ancient and steady tree that has long been an icon in our community. The downtown location, on a piece of land where the original railroad ran through Winter Haven, inspired “Junction.” Cypress Junction Montessori looks forward to bringing students and staff from all areas of our community together and fostering a love of learning using the Montessori Method right in the heart of Winter Haven. Families can find out more about Cypress Junction Montessori at CypressJunction.org or by following the school’s Facebook page which is updated regularly. Any questions can be directed to info@cypressjunction.org.